Intelligent Investor: Listed Firms must have 25% public Holding..Who will benefit from it? Listed Firms must have 25% public Holding..Who will benefit from it? Here comes the UPA Government Promise of increasing public stake in PSU. Govt made changes to the rules of listed companies to maintain a 25% non -promoter holding ..mean public holding it includes FII,Mutual Funds,other corporates as well as Retail Investors..
"These amendments include raising the minimum threshold level of public holding to 25 per cent for all listed companies and requiring existing listed companies having less than 25 per cent public holding to reach the minimum 25 per cent level by an annual addition of not less than 5 per cent to public holding "
But its not clear what if companies don't achieve the target will they be penalized ? 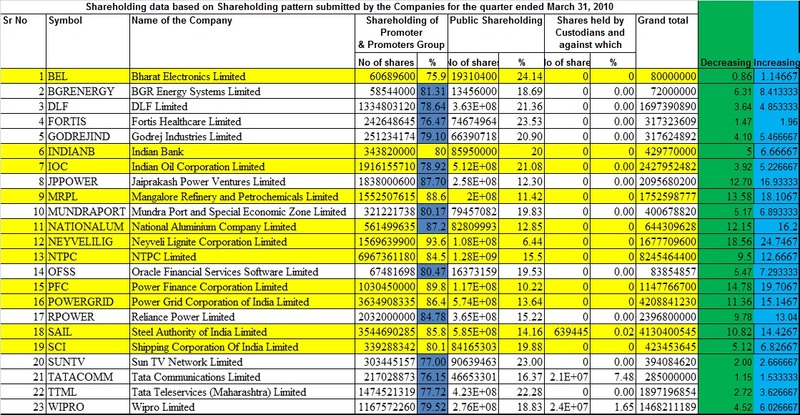 Down is the list of top companies with respect to Mcap who have more than 75% with promoters.. Marked in Yellow are PSU's and government is majority holder with more than 75% in it. 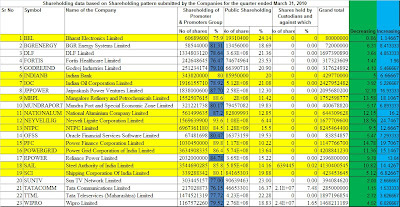 The limit can be achived in 2 ways one is to sell the shares to public and others is two go for fresh issue of issue of shares to public there by keeping same number of shares with it and increasing public shares..
Another question comes up..how are they going to price the issue..From past history we can clearly see when ever we have a stake dilution by govenment we can see market reacting negatively towards it example of recent FPO are REC , NTPC, NMDC NMDC offer tanking a lot after the announcement of stake sale..coz they will go for a disscount to the existing CMP to attract the investors ...so can we expect the same for these companies in coming days . Apart from PSU's we have JP Power,Reliance Power,WIPRO,DLF and others should be divesting stake though its very less when compared to PSU's .Since its a small stake for them i guess they can manage..but are they ready for it..have to see?